Sick of the traditional reds and greens? 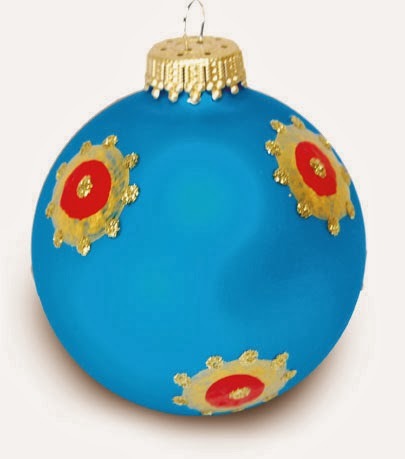 This Bejeweled Painted Christmas Ornament dazzles with bright blues and golds, making it great for more vibrant Christmas decor patterns. Homemade ornament designs like this are easy to customize to suit your style, and you'll love how simple and fun these colorful ornaments are to make! Use 3/4" pouncer and Splendid Gold to paint dots on ornament. Let dry. Use 3/8" pouncer and Festive Red to paint small dots in center of large Splendid Gold dots. Let dry. Use Gold Craft Twinkles Writer to paint small dots around edge of large circles and at center of Festive Red circles. Let dry.